I made this sourdough to test-drive my new sourdough starter, and for a first loaf with a baby starter, I was thrilled with how it turned out! 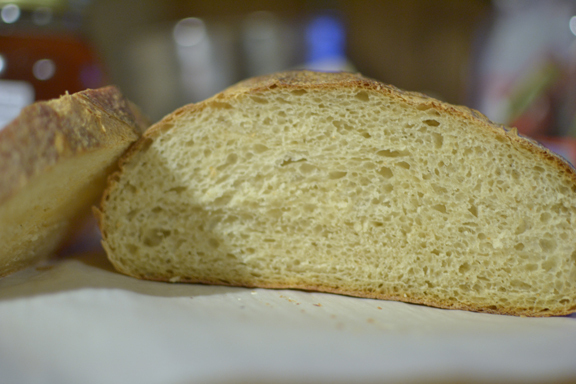 The round, golden loaf has a chewy crust, perfect interior for toasting and buttering, and had a decent dose of sour. The starter gets mixed with flour and water the night before bread-baking day, and it’s that overnight fermentation that helps develop the flavor of this sourdough. 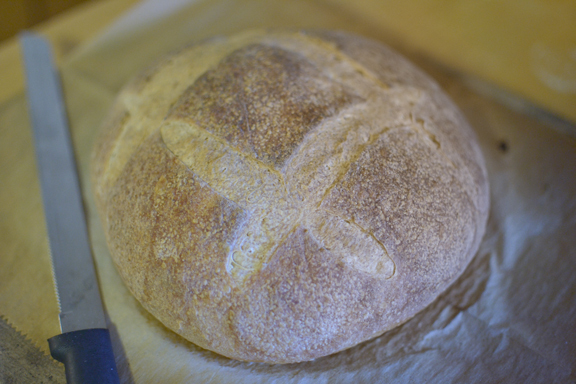 I can only expect my loaves to improve as the starter matures, but this was a great beginning. The afternoon before baking day, mix the starter, flour, and water well until you have a smooth batter. Cover with plastic wrap or a damp towel and let it rest at room temperature for 3-4 hours. Once it’s done resting, refrigerate the preferment overnight. Pull the bowl of pre-ferment out of the fridge and let it warm at room temperature for about 30 minutes. Add the remaining ingredients and stir until combined. Depending on your starter, you may need to add extra water or flour to form a soft dough. Knead by hand or with a dough hook for 5-10 minutes, until the dough is smooth and tacky, but not sticky. It should pass the windowpane test, and will probably stick to your kneading surface but will pull away cleanly when coaxed. 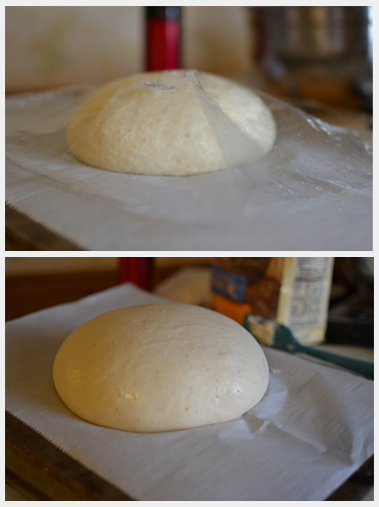 Place the dough in a lightly oiled bowl, cover, and let rise for 2-5 hours. Depending on the activity of your starter and the temperature in your home, the dough may rise quickly, or…not. Mine took about 4 hours and ended up doubling. It’s hard to predict what yours may do, but with any luck it will at least get good and puffy. A dent made by poking the dough should stay indented when it’s risen enough (you can see the dents in my fully risen dough). Resist the urge to put it somewhere very warm to hasten the rise – it’s a long, slow, rise that will give the bread a good sour flavor. Once the dough has risen, turn it out onto a lightly floured surface, but don’t punch it down. The gentle deflation from turning it out and shaping the loaf degassed my dough enough. 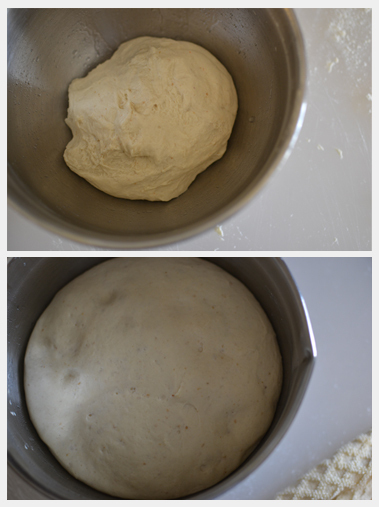 Shape the dough into an oval, a boule, or whatever shape strikes your fancy. I found a tutorial that was helpful in shaping this round loaf so that it has a smooth top and will bake well. Place the dough on parchment, silicon, or a cornmealed baking sheet. Sprinkle it lightly with flour and cover with plastic wrap. Let the dough rise again, until it has (hopefully) doubled, or at least swelled up. My second rise took about 3 hours at room temperature. Towards the end of the second rise, preheat your oven to 450 degrees. If you have a baking stone, let it preheat with the oven for about 40 minutes. When the oven is ready, slash the top of your bread using a razor blade or serrated knife (I bought a scraping tool with a razor blade for this purpose…$2.50 in the tools section of Target), and slide the bread into the oven or onto your baking stone. For a chewier crust, spray the walls of the oven with warm water before closing it up. Bake the bread for 15-20 minutes, until the top is golden and bottom sounds hollow when it’s tapped. Turn off the oven, crack the door, and let the bread cool with the oven for half an hour. Once you pull the loaf out, let it cool to room temperature before digging in (if you can resist it that long…we sure couldn’t). Also, my starter needs a name. If I’m going to keep on feeding her and putting her to “bed”, she’s gotta have a name. Any ideas? On starter: you want to use starter that is good and active for this recipe. If you’ve been storing it at room temperature, feed the starter 6-12 hours (or however long it takes it to double) before making the pre-ferment. Make sure you have enough starter so that there’s enough to save after pulling out the 4 ounces for this recipe! If you’ve been keeping the starter refrigerated, pull it out a day or two before making the pre-ferment so it has time for a couple of feedings before it gets put to work in your bread. Flour: This recipe originally used weight measurements, but I switched to volume since it’s usually easier. To keep proportions right, I recommend spooning your flour into a measuring cup and then leveling it off. Whenever I scoop it straight from the bag, I end up with too many ounces of flour and have to adjust the water accordingly. Of course, you could do that too, but it’s simpler to just spoon and level. Tags: baking, bread, fermentation, sourdough, vegan, vegetarian. Bookmark the permalink.